I don’t know about you, but over the years I’ve had a lot of discussions about what makes “the” perfect writing environment. From tiny mascots, like my black cat Kiki from Kiki’s Delivery Service, to whiteboard calendars and eucalyptus-spearmint candles, there is no shortage of design elements that can be added to make your writer’s workspace comfortable and stress-free. Eventually, however, every writer realizes that obsessing about physical places could impact our productivity in the worst way possible. If you want to write, you should be able write anywhere, at any time, with the materials that are available to you—even if you’re sitting at your kitchen table with a pen and paper. As long as you’re focused on filling up a blank page because you have to write—absolutely and without question—you will write your story no matter where you are, who you’re with, and what’s around you. If this was true, then why do we sometimes obsess about what makes a great place to write? It’s because the words “writing workspace” are really code for “a place to get in the zone”. Yes, I’m talking about “the” zone, that magical, beautiful, wondrous space-time continuum bending reality when the words flow from your enchanted fingertips like a sparkling waterfall filled with rainbow-colored stars and chocolate-flavored ponies. The zone is perfect for you, because it’s a place where you don’t struggle to write. When you’re in the zone nothing—no barking dogs, screaming kids, overbearing boss, or past due deadlines—will get in the way between you and your soon-to-be finished wordcount. This is probably the reason why a lot of us write fiction, because the zone isn’t a real place, it’s all in our heads! The good news is that having a designated writing workspace can help you get in “the zone”. Think about it. If you’ve ever been in the zone before, then you know that you can get there again. Or, in other words, your workspace is a tool you can use to make it easier for you to get in the habit of writing. Find One or Two Specific Spots. By determining a specific place in your home or apartment to write, you’ll increase your chances of subconsciously associating that spot with “the zone”. Try them out, to see if you can sit in these places for a hour or two. After all, this will become “the” place, and no other, where you pledge to do nothing but write. There are a few other benefits to assigning yourself to a specific spot ranging from building good, self-disciplinary habits to signaling your roommates or family that you wish to be left alone for a time. Sometimes, too, it’s helpful to have an alternate spot so if you get stuck and you’re not getting anywhere, you can quickly change your environment to try another option you’ve figured out ahead of time. Have your Research Materials Handy. Some writers type [insert name here] or [cool historical tidbit here] while they’re writing, so they don’t stop typing and continue telling the story. Then, they go back and fill in those descriptive details afterward. I am not one of these writers, because I often incorporate historical tidbits and specific word choices that might impact the plot or other passages. Most times, I do my research ahead of time, but there are days when I throw myself into a project willy nilly and have to stop because I need to look something up. If you’re like me, you know there’s a good possibility you could abandon your plot and dive headfirst down the rabbit hole of research. To avoid this temptation, try grabbing a stack of reference materials you’ve screened ahead of time and label them accordingly. I usually set aside no more than three books or websites that I’ve vetted ahead of time, and one of them is almost always a dictionary. Determine your Noise Comfort Levels. If I’m in the zone, it doesn’t matter what sounds are around me. Other times, especially when I’ve got a case of the “idonwannas”, I put my noise-canceling headphones on and listen to…nothing. No music, no words, no lawnmowers, no cars whizzing past. Just silence. Then, after a few minutes, I’ll put instrumental music on, and avoid any songs with words in them until I’m writing consistently again. Your mileage may vary, of course, but if you’re sensitive to sound, you might want to address what your noise comfort level is before you sit down to write. Personalize and Accessorize: What you have in your workspace is really a matter of personal preference, but I feel simple things like color and light can also help inspire you or impact your mood, too. Some writers love to be in a well-lit area; other writers prefer to avoid windows and, at times, sunshine all together. I prefer moderate amounts of light, for example, but absolutely need my bookshelves and electronic keyboard. My walls are covered with character-rich art I’ve collected over the years and range from the Marvel comic book version of Thor to a black, tin skeleton. I also have a betta fish named Lady Crescent Moondragon swimming nearby, along with no shortage of knick knacks and a growing origami collection. These things are personal comforts to me that I’ve used to turn “a” space into “my” space. Build a Writer’s Emergency Kit: Timer, tissues, chapstick, hand lotion, painkillers, chocolate, cough drops, bottle of water, eyeglass cleaner… Grab all the little things you might need throughout the day, and put them together in a kit you can access. This way, when you’re in the zone, you don’t have to get up from your desk to take a break and risk getting distracted. While I don’t recommend sitting on your bum for hours and hours at a time, having what you need nearby will cut down on a lot of unnecessary trips. This way, you can exercise the option of leaving your desk at a good stopping point, instead of when your nose is running. Cosplay Like You’re At Work. This is probably going to sound super silly, but you may have heard that the best part about writing at home is that you don’t have to wear pants. This doesn’t work for me, because while I look like the living death when I’m on a deadline, I dress up every day to write. That means I get dressed as if I was going to a job, because I am going to work. My writing workspace reflects this, too. If you’ve got the space and the time, try designing your writing workspace as if you would if you were showing up to your ideal full-or-part time job. You’d be surprised how much dressing for the part can have an impact on your psyche—even this is your first time writing a story. Alternatively, consider having a specific piece of clothing, jewelry, or an outfit you pledge to wear whenever (and wherever) you’re writing, too. Having physical anchors can serve as reminders and motivators to keep you writing. Many of these tips I’ve shared here are designed to drastically reduce tiny, annoying decisions that might occur in a less-than-ideal workspace before you sit down to write. Don’t be afraid to customize your environment to suit your needs. If clutter works for you? Great! After all, all that really matters is the fact that you’re writing, writing, writing. 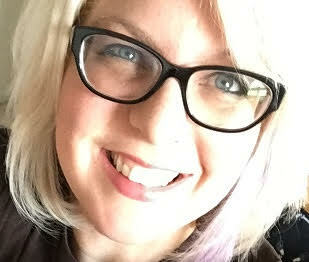 Monica Valentinelli writes stories, games, essays, and comics for media/tie-in properties and her original works from her studio in the Midwest. She’s a former musician of 20+ years and a graduate of the University of Wisconsin-Madison’s Creative Writing program who now writes full-time. Recently, Monica has filled the shoes of lead developer and writer for the line of Firefly RPG books based on the Firefly TV show by Joss Whedon, and her new book The Gorramn Shiniest Dictionary and Language Guide in the ‘Verse will debut from Titan Books in Spring 2016. Her sanity is kept by her two cats, water frog, bettafish, and her long-time partner. When she’s not obsessing about deadlines, she designs jewelry and dabbles in other artistic endeavors. For more about Monica, visit www.mlvwrites.com. I’m over at my agency today talking about writing workspaces for NaNoWriMo. Check it out! Great tips, and I feel especially strongly about dressing the part– clothes have more power than we think to change the way we feel and behave. I love the idea of dressing like one of your characters! I write mostly non-fiction (at this moment, anyway), mostly how-to, so I like to dress as if I’m giving a live presentation; it makes me feel more confident, capable, and professional. When you think about it, we do use clothes as uniforms– work clothes, lounging clothes, weekend clothes, going-out clothes. Why not writing clothes? very good advice I so recognise myself here.